As the most popular content management system (CMS) in the market nowadays, the WordPress has never come short on themes to keep its users satisfied. However, the unfathomable number of available themes to choose from can leave you quite confused on which one can work best with your website. Since not all themes are suitable for different kinds of content being hosted on a website, it is important to remember the basic guidelines to choose the most appropriate one. First, your theme of choosing resembles the overall image of your brand. That is why it is important to identify the basic elements that you want your website to convey to your audience first. For instance, if you want to show the simplistic yet effective approach to your business, you might as well choose a minimalistic with light fonts. Aside from design, you should also heavily consider the responsiveness of theme to ensure that any devices can display your content appropriately. Another thing to ponder is the suitability of theme to your website’s content. Most of the successful website nowadays was not built upon the most elegant theme available, but on the primary purpose of the website itself. Knowing the reason why you need to build the website should be the basis of what features you should include in your theme. This will save you a lot of time and effort from choosing a theme that you can barely tweak or adjust according to your liking. Best reasons to customize your WordPress Theme. Furthermore, it is also important to keep in mind the difference between free and paid themes. Although a lot of users are using free themes on their site, there is a good reason why paid themes exist, as they offer greater flexibility and customer support in case of malfunctions. Learn more by checking this infographic from WP Shrug as they give you some of the practical tips that can help you decide which theme should you choose for your WordPress-driven website. If you think that the above infographic was helpful to choose the best WordPress theme, then please let us know through your comments. Thanks for this, Steve. I recently got a new theme – Divi by Elegant Themes – and I love it. I used Optimize Press for many years, but when I started my new blog from scratch, OP didn’t have the right feel. I’m very happy with Divi, and there are some good plugins on Elegant Themes that work well with it. I know I’ll continue to fool around with it, but it will do me for a long time. Thanks for supplying all this information. This is indeed a timely post to me,as I was looking for a change in my theme. 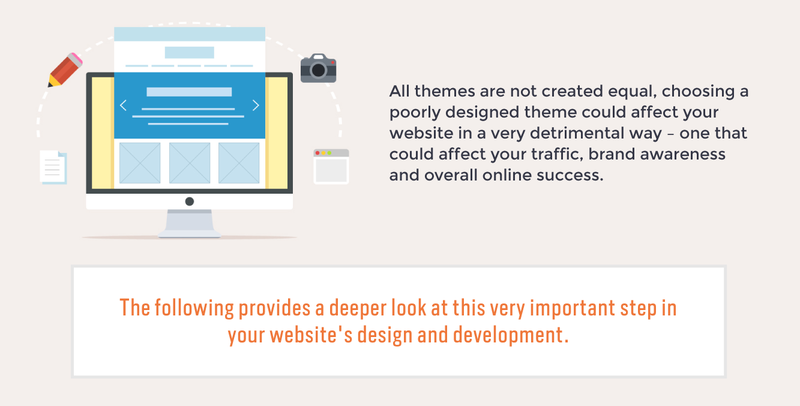 The infographic is a good guide for people like me who look for a new paid theme. Thanks Steven for this informative post. Wish both of you a profitable week ahead. Thanks for sharing your feedback Philip Sir. You have shared quite a number of areas in which one must focused while selecting a theme for our websites/blogs. It seems looking at their visual attractiveness is one thing, one must look into whether its overall purpose sync with our blogging niche. Hope your post will help newbies in selecting the most appropriate themes for their websites/blogs. BTW I am totally against free themes-not that they aren’t flexible for customization but rather considering my personal ego of not wanting to use FREE things. Hey Sherab, yes we must not get distracted by attractiveness but also see what other qualities a theme has 🙂 I would also encourage you to look at some of the free themes on offer within the WordPress repositry – they may be simple but they have gone through tests set by WordPress so they are some of the most well coded and performant themes out there! For a perfect blog, you must go with the best theme. There are many theme providers in the market but people don’t check the basic things of an SEO friendly theme. They don’t see the options of the customizer. People need to know the basic things of a good theme including the responsiveness, better HTML layout and the design. Like DeeDee I settled on Elegant Themes Divi and use the Divi Extra theme too. I’ve tried many premium themes, and theme clubs, and nothing comes close as far as complete and easy customization. I now have a lifetime developer license and can use it on as many sites as I want. Most beginners feel overwhelmed when it comes to selecting a theme for their WordPress site. There are thousands of free and paid options. Each theme looks better than the other. Many WordPress themes come with tons of customization options. If not coded properly, these options can make it difficult for us to change themes or use other WordPress plugins. Many WordPress themes come with lots of colors, complex layouts, flashy animations, etc. Sometimes we may need those things, but in most cases we don’t really need all that. We need to make sure that the theme’s presentation style is not overly complicated. The purpose of web design is to help users find information they need and to help site owners achieve their goals at the same time. If a them looks great but does not help to get new business or subscribers, then it is not a good theme. It is also not a good theme when our users can’t really find their way around our website. Our WordPress theme plays a crucial role in our site’s SEO friendliness. A good looking theme can still generate poorly coded HTML, this could affect our site’s performance on search engines. Another solid indicator of a WordPress theme’s quality is ratings and reviews provided by their users. If the theme is sold on a third-party marketplace, then we need to see customer reviews. Eventually, thanks for sharing your wonderful thought with us. When I started out blogging I made the big mistake of just choosing a site the looked pretty with no concept of any of the other important factors you mention. I burned my way through a few paid themes too that others had recommended but I just couldn’t fathom out how to get going with them. I don’t want to have to have a degree in WordPress, I want something simple that works. I’m currently using Focus theme from Thrive. Wish I had even know to look for a post such as yours when I started, before making many expensive and time-wasting mistakes. I am glad that you liked Stevens post. And Also felt said that you didn’t read this type of post when you needed it. Although Thanks for your feedback. I use WordPress and choosing a theme was the most challenging job for me. I had chosen a theme without keeping anything in mind, except design. I have to reconsider keeping all the points in mind you have mentioned. Thanks a ton! Have you since changed your theme, if you do send me a link, cheers! I indeed that a good responsive SEO friendly theme is necessary to a WordPress blog. Very Nice post as we all know a better theme can play a big role in our business and its very essence. Your post has cleared it, thanks for the post. I’ve encountered similar problems when choosing a WordPress theme. I am currently using Blogginglove theme which is developed by Ravi Chahar and I must say new blogger who does not have much money to buy a theme they should try blogging love theme because it’s absolutely free to use. Great post I liked it very much. Especially the info graphic. It tell us more details that are involved. I must say that you have a really good infographic. And for sure it has helped me to learn some new things. thanks for this website. it’s help me a lot.